That's more like it! And they're back in the play-off positions. More here. I got to my first Orient match of the season yesterday. A season ticket-holder sitting behind me in the west stand reckoned the team's elevated position in League One thus far has been slightly false, so maybe the seventh spot they've slipped to since winter kicked in is about right. As goalless draws go their encounter with Gillingham wasn't a bad game, with Orient slightly the better team on the whole. 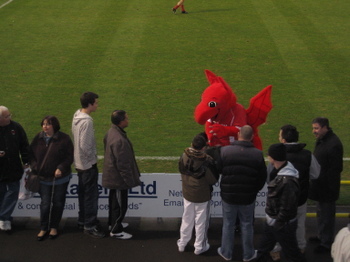 And my grown-up son - tall, light-coloured top - got to shake hands with Theo the mighty mascot. Result! "We have the ambition to move and our negotiations over the next few weeks and months, I am sure, will bring a deal to fruition. We're an ambitious little club who, because we have the best squad we've had in light years, suddenly find ourselves on top of League One and the ambition burns a little brighter. To be based at the Olympic Stadium is a great postal address, and if we were there with the finance from developing our existing ground, then perhaps we can look at that little light at the end of the tunnel and say 'maybe, just maybe, we can go somewhere.'" Top of League One. I'll repeat that: top of League One. Blimey. Full report here. After last year's death wish relgation struggle, imagine my amazement at returning from holiday to find Orient at the top of League One after winning their first three matches of the season. 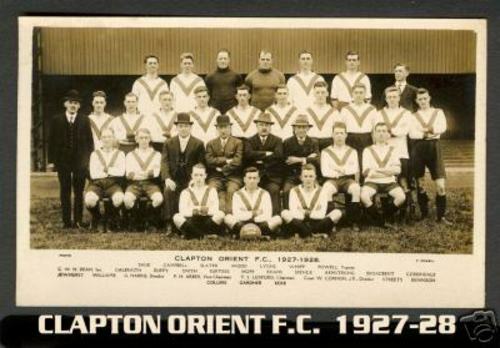 It also gives me the perfect opportunity to publish this picture of an Orient team when the club was called Clapton Orient. Glorious. Thanks to Felix for finding this on eBay.